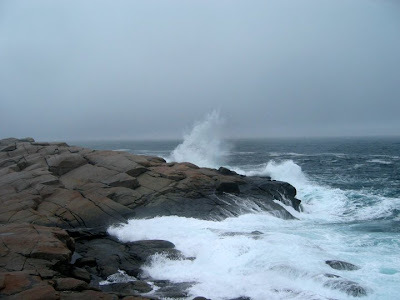 Recently I visited Halifax, Nova Scotia for the first time. 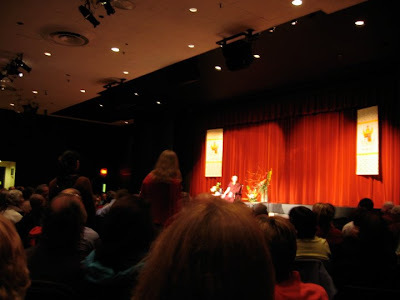 My good friend Corinne had generously enabled me to travel to see her and attend a lecture by Pema Chodron, a buddhist nun and author who lives and teaches at Gampo Abbey on the Cape Breton coast. The weekend was filled with good friends, misty landscapes and the knowledge that I cannot stay away long from such a special place. 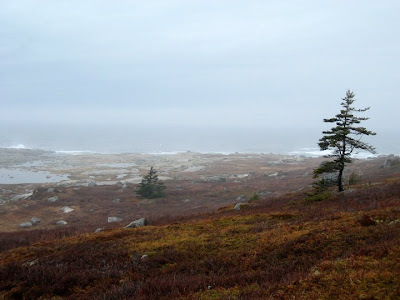 My first impressions of Nova Scotia is how similar in temperament and topography it has to certain areas of Newfoundland. The people are warm and open, laugh and love with their entire being and would give you the shirts off of their backs. They possess a vivaciousness and I found that I shed a bit of my Ontario reserve while I was there. Their enthusiasm is infectious! Corinne and I met up with some of her good friends and en masse we made our way down to Dalhousie University for Pema Chodron's lecture Friday evening. Sorry for the blurry quality here but I didn't want to use flash! The lecture hall was packed. Standing room only. I would guess that there were about 350 people there. Pema rarely lectures and this evening served as a fundraiser for the abbey that is perched at the end of the world on the beautiful cliffs of Cape Breton. There was a great assortment of attendees from ordained monks to lay people. I have a small collection of books that Pema Chodron has written. They are little touchstones of wisdom that I can easily reach in a time of challenge, anxiety or uncertainty. One does not have to be a buddhist to listen to and practice their tenets. After some words from the abbey director Pema came out and spoke beautifully for over an hour, after which she took questions from the audience. The evenings lecture was on Wakefulness and Fearlessness. Pema explained that often our habitual nature keeps us in ruts, that we need to open our minds and beings to experiencing every moment as it is, being receptive to it, and only then can we show compassion and love for the world and everything in it. To be afraid, to be anxious, is human. However, we can practice courage and walk into that which terrifies us. This will help us through it, will help us accept it for what it is, observe it, and learn from it. I took away a lot from her talk. I know my friends did as well. Pema emitted an energy that was quite palpable throughout the auditorium. Her words are inspirational and comforting too. Her words are tools which we can equip ourselves to deal with the trials and tribulations that happen in our lives. As Thich Nhat Hanh says "the most precious gift we can offer others is our presence. When mindfulness embraces those we love, they will bloom like flowers." If you haven't readhis book Peace Is Every Step, I highly recommend it. Corinne, myself and her friends had a great weekend visiting vegetarian restaurants socializing, exploring and spending quality time together. Corinne and I went to the Farmer's Market Saturday morning. She mentioned that it has been going since the 1700's! It was a vibrant scene with lots of fiddlers, vendors and people buying local produce and crafts. Below is a picture of the building in which the market takes place. 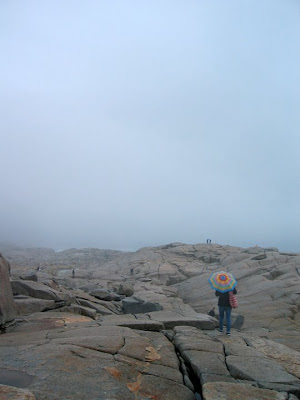 We made a trip out to Peggy's Cove after the market and some lunch. 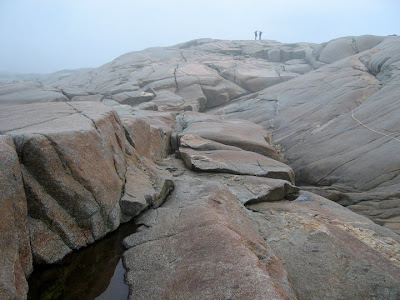 Peggy's Cove is one of the more popular spots for visitors to stop at and I can understand why. The day was misty and cool, which cast a slightly melancholic air over the day, but not in a bad way, in an introspective way perhaps. Below you see some of the waves that were hitting the shore. These are small compared to when it is quite windy. We stayed well back as a few unfortunate people have been swept out to sea when they stood too close to the water! It was misty and I was surprised to see so many umbrellas. This young woman's rainbow umbrella stood out to me in particular as a nice contrast with the weather. 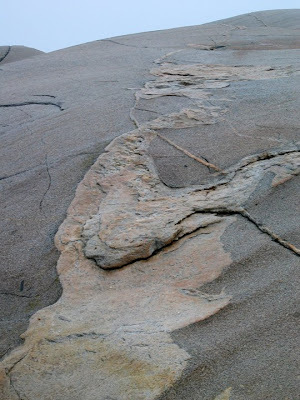 I love the shape and texture of these rocks along the coats. They were so thoroughly organic and unique, they appeared to be liquid but were the first thing from it. 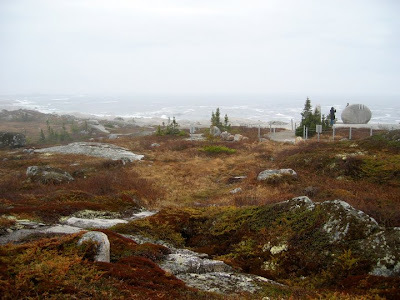 There were quite a few people there by the lighthouse, arriving in buses and visiting the gift shop, ambling around the rocks and taking pictures, but it never seemed crowded. We were left with our thoughts for the most part and the smell of the salt in the air was so evocative and resonated with some primeval part of me. I can understand why so many have been hypnotized by the ocean. From Peggy's Cove Corinne and I drove a short distance to one of two memorials to Swissair Flight 111. 229 people lost their lives in the tragedy that occurred in 1998 and the people of Nova Scotia jumped to help in the wake of the aftermath. We walked around the memorial for some time and gazed out at the ocean. A rather somber moment and we were quite moved by it. The memorial sits almost right on the water, surrounded by a wash of burnt-coloured vegetation, craggy rocks and seabirds skimming the shore. Once back in Halifax Corinne had a few friends over in the evening. She had also purchased one of my paintings a few months ago and the "unveiling" happened that night. 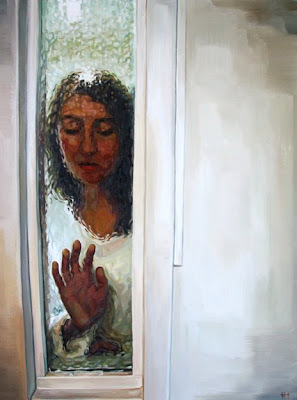 Usually I am not present when people who buy my work see it for the first time, but "Through The Glass" had come from Toronto and I was so thrilled to participate in the moment when Corinne saw it for the first time in person! It is a particularly poignant painting for her and it was a special moment that we all shared. The house was filled with laughter and merriment, new friends and great connections were made. These are the moments that stand out when we look back on our lives and take an inventory of love given and received. During the evening Corinne brought an envelope out for me. 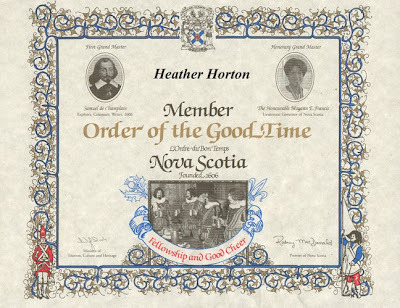 Inside was a certificate indicating that I had been formally accepted into the oldest social order in Canada: The Order Of The Good Time. In November of 1606, Samuel De Champlain, in order to maintain the morale of those enduring the hardship of the winters in the north. There are no initiation fees, no annual dues and no formal meetings. The members simply must: have a good time, remember Nova Scotians pleasantly, speak of us kindly and make sure to return. I was so touched by this gesture. I will frame the certificate and endeavor to uphold the responsibilities that have been placed upon me. I will do so enthusiastically! Sunday was exciting because we were able to visit Point Pleasant Park, a very special park that Corinne has visited all of her life. 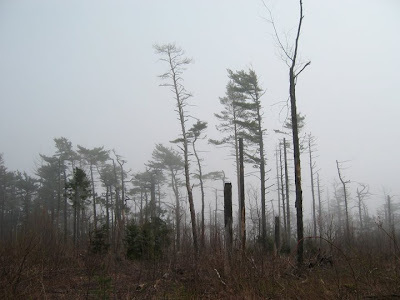 A few years ago there was a hurricane that did a lot of damage within the park and its effects are still seen and felt all around. I think it was difficult for Corinne to see such beauty destroyed but I pointed out that perhaps we could concentrate on the cycle of renewal that is taking place: new plants are growing, small ones have been given a chance to thrive and more sunlight can reach the ground to nurture another turn of the earth in the park. The mist created another haunting day as runners glided past us and disappeared down winding paths as we explored historic buildings and listened to the silence. 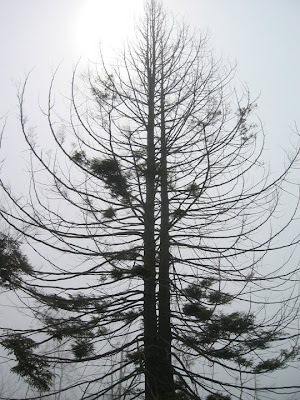 The trees in many places were like beautiful skeletons. 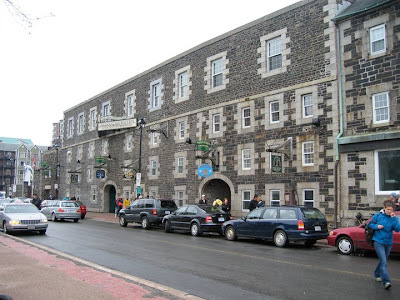 I left Halifax that evening after meeting my new friend Jay from Cape Breton. What a fantastic person, one in a million and the salt of the earth. We have both been moved in a profound way by Chris McCandless' story and wanted to meet. Geography, when faced with passion for a cause, reason, or goal, ceases to be an obstacle! We talked about perhaps taking a journey to many of the places that Chris traveled so that I can shoot reference for paintings that I will be working on later this year and next. I am so appreciative of Corinne's generosity that allowed me to see another pocket of this gorgeous country. Halifax and the people there made a great impression upon me. It is only a matter of time before I return! Heather, I cannot describe how excited I was and still am by your visit. Thank you for writing an essay on some of my favorite places in the world that mean so much to me. 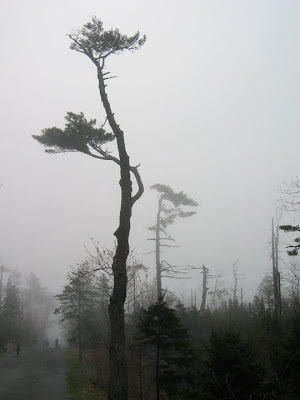 Your perspective on Point Pleasant Park and the images have given me something to love again about the park. Your everlasting support and company in person was as amazing as ever. I'm thankful to know such a wonderful person and artist.